Home › Business › Crash Dammit! Have Canadian Real Estate Prices Climbed Too High? In 1997, there was a famous cover story in the Economist about American stockmarkets entitled “Crash Dammit!” Frustrated analysts just couldn’t understand why massively overpriced shares kept on rising year after year. Surely, a crash was coming! Instead, investors rode three more of the best years of the dot-com boom…then it did crash in 2000. The point is it’s impossible to predict when a bubble will burst. The trouble is that Canada effectively has three housing markets. 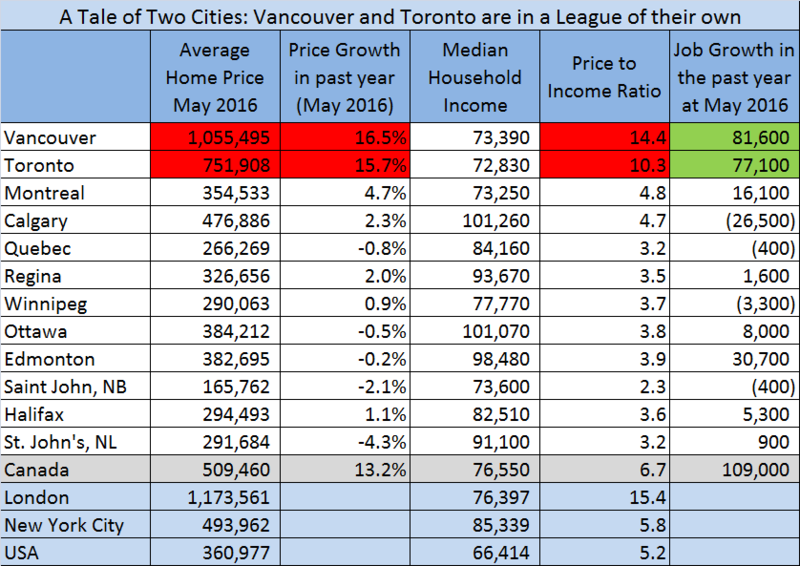 In Toronto and Vancouver, price growth is soaring 16% per annum, and affordability has plummeted to crisis levels. Then, there is a boring middle tier of cities—Ottawa, Quebec, Regina, Montreal is a little hotter—where home prices have been mostly stable, rising around 1.5-3% per year over the past five years. Finally, there are parts of Alberta and Newfoundland where home prices are declining. The extreme divergence shows up in the Price to Household Income ratio, which is normally 3 to 4 (e.g. if household income is $50K, then a home costs $150K to $200K). Once that ratio reaches 6 or 7, we get into bubble territory. The only markets that are flashing red warning signs are Toronto and Vancouver. That’s why we’re worried that a flood of foreign funds is pushing real estate skyward. In the 12 months through June 2015, Chinese investors bought $18.4-billion (U.S.) of real estate in Australia and $28.6 billion in the United States. Canada (incredibly!) doesn’t have hard data on foreign real estate sales, but National Bank estimates that Chinese buyers account for one third of Vancouver’s condo market. But the second factor is that Toronto and Vancouver have accounted for almost all of Canada’s job creation over the past year. This is a world-wide phenomenon where big globalized cities like London, Paris and New York are pulling in the hot new service sector jobs—finance, technology, design—and surging ahead of the rest of their countries. So the question is what to do? Is the public policy goal affordability for everyone? Reducing speculative risk? Preventing bubbles? Tighter mortgage rules are a good idea, but they haven’t solved the problem. Before we consider taxes on foreign buyers, we need better data and to agree what the goal is. There is not a national policy that will work for Vancouver and St. John’s. We also have to beware of unintended consequences. In 1974, Ontario brought in a 50% tax on profits from land sales to prevent speculation. The market collapsed overnight.